It’s been way more than seven weeks. The crisis in Puerto Rico isn’t going away and now they are mentioning illness and death from contaminated waterborne diseases. We are stunned that no one seems to be doing anything to alleviate the suffering of our fellow Americans. I guess because they have a non-voting member in Congress, and can’t vote for President, they aren’t deemed as worthy as Texans and Floridians in the eyes of a power-mad administration and a leader-in-chief with no empathy or conscience. But this isn’t a political diatribe, it’s an attempt to see what is happening in our nation’s dependent commonwealth and how we can help. Because of communications issues, we wrote to a family connection, Terry Chevako Bava, a number of questions and she took the time to answer them fully. We give you her un-altered answers. Tomorrow it’s seven weeks since the hurricane. We had power today for the first time, for five minutes. I’m hopeful that a hot shower is in my future! Lines at banks continue, and “no gas” signs are still a regular feature at stations. But communications are much more reliable and running water seems to be available more days than not. The death rate, however, continues to climb. Deaths are called “natural” and not hurricane related, but deaths caused by heart attacks and even dehydration are on the rise. People are suffering. Can you describe where you live in Puerto Rico before and after Hurricane Maria? My husband and I live in Dorado, a town on Puerto Rico’s north coast, about 15 miles west of the capital, San Juan. My brother lives with us in our gated community and my parents live ten houses up the street. Our houses are concrete, built to withstand hurricane-force winds, and my house has “tormenteras,” or metal hurricane shutters, that we put up when first Irma and then María threatened. Normally, what are your job and family like? I am a teacher at TASIS Dorado, the private college prep school that our son graduated from in 2014. I work with seniors applying to college who have had to deal with rescheduled SATs, canceled visits from colleges, fly-ins they couldn’t attend because they couldn’t book a flight out, shaky internet making it difficult to upload applications or even contact schools to ask questions–and they’re the lucky ones. Many public school students are still waiting for classes to resume. My husband is a stevedore, unloading bulk grain, rice and other commodities at the ports. We usually have no power, running water or communications. We could get a cell phone signal by driving 20 minutes up the highway. We had stockpiled food and water before the storm, but not enough. For the first two weeks each day started by figuring who would try for what supplies. Let’s all go to Costco so we can get two cases each of water. That entailed fours in line outside, 45 minutes inside waiting in the water line, and another 45 minutes in line to pay. I couldn’t buy much there since I don’t have a generator and can’t refrigerate perishable items. Getting gas took from six to ten hours since they were rationing it. One day my brother had my car in line from about 3 am until noon—without getting any gas. He developed a rhythm for the gas line and had his supplies: a chair, an umbrella for the sun or rain, some fluids, and reading matter for when the others in line weren’t feeling chatty. About 20% of the island has electricity (not my town). Many people have generators, but you can’t run them full-time, and even so, you can run only a few appliances, not an entire household. 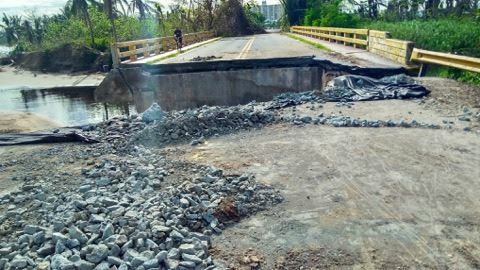 No power means no traffic lights – ok in my small town, but my husband’s commute is a bear since nobody heeds “yield to the right.” Plus, bridges were washed away on two of the three main roads (photo) between San Juan and Dorado, so a 20-minute commute now takes two hours in dry weather, longer when it’s raining. No running water means no washing dishes. Flushing toilets means using precious supplies (You have to pour water at just the right spot to make it flush with a minimum of water.) Bathing with a cold gallon of water in the dark before work is a challenge. A teacher at school tried to heat some water over a propane burner to bathe her little girls, but she knocked over the water and gave herself second degree burns. We know you are originally from Cleveland, Ohio. What took you to Puerto Rico? Parents (Ronald and Anne Chevako) first moved to Puerto Rico with Mobil Oil in the late 60’s then mid-70’s. They settled here permanently in early ‘80s (when my brother Jay and I were high school students). I returned home to Puerto Rico in the early 90’s. I met my husband, Tony Bava, here, although he is from the San Francisco Bay area. Our son Julian was born here and is now in his senior year at Stanford University. Julian was here after completing a summer internship, so he weathered the hurricane with us, but made it back to the States in time to start classes. What has been happening with your family during this period? We are fine. Life without power, regular running water and regular communication is inconvenient, but our island has been devastated, and so many people have it so much worse. The school where I teach, The TASIS School in Dorado, weathered the storm fairly well. We lost a classroom and a lot of trees and had some flooding, but since other island schools were completely destroyed, we were lucky. We reopened for classes quickly and have about 95% of the school powered by generators. It’s my refuge! However, in our town alone, more than 1,100 houses lost their roofs and more than 650 homes were completely destroyed. More than 70 people are living in a refuge, a local school, in squalid conditions. I struggle not to cry when I deliver the donations people have so generously been sending from Florida, Hawaii, Massachusetts, and everywhere in between. What help has the Federal government been to you? To me personally, none. I wish they would help the neediest among us. I saw one blue tarp and thought FEMA was finally helping my town, but it seems not. My parents run a non-profit library that serves as a community center. This will be even more important since public schools will not open until October or November, and some even later. The government could help groups such as theirs to get rid of mold contamination, acquire generators and assure a steady supply of diesel to run them. They are currently holding music lessons in their outdoor parking lot to provide some relief, and they will offer more of their programs as they are able. How do you feel about the President’s statement that aid workers can’t stay in PR forever? It would be nice for them to provide some real relief before the president talks about taking them away. We have been US citizens for a hundred years, and per capita we send more people to fight in US wars than most states do, but the hurricane victims in Puerto Rico don’t seem to be getting the same relief as the victims of natural disasters in Texas and Florida. What can we do to help? What do you need? Are you receiving mail and packages? Distribution by large organizations has been a problem. Every leaf on this island is on the ground, and it seems half the trees and branches are, too. Wood and concrete light posts also fell, and mudslides occurred all over the island. People are still trying to clear paths, and continuing torrential rains exacerbate the distribution problems. Many smaller groups and individuals are receiving donations via USPS priority mail, UPS and FedEx and distributing to people they know personally and to refuges, or they are simply driving to more remote areas and distributing goods. Clothes (especially L and XL, shoes, personal hygiene items, flashlights, battery-operated fans, batteries, canned food, baby formula, diapers, adult diapers. Terry’s words cut right to the quick. If our government won’t help our fellow citizens, then is it up to us. They need clothes, water, dry goods (and not just paper towels) and anything else you can think of to donate to them. The site that Julian set up to benefit the library and the Dorado community is: https://www.youcaring.com/janesterndoradocommunitylibrary-971474 Contact them and see how you can help, or contact us at [email protected] and we’ll connect you too.